Charmaine Sia, RJC alumnus and currently a senior at Massachusetts Institute of Technology, was recently named co-winner of the Alice T. Schafer Prize for Excellence in Mathematics by An Undergraduate Woman. The prize is named for the former president of the Association for Women in Mathematics (AWM) and one of its founding members, Alice T. Schafer, who has contributed a great deal to women in mathematics throughout her career. The criteria for selection include, but are not limited to, the quality of the nominees performance in mathematics courses and special programs, an exhibition of real interest in mathematics, the ability to do independent work, and, if applicable, performance in mathematical competitions. Charmaine is, in the words of her teachers and mentors, an “astonishing” student who “has distinguished herself in every possible way” and is “already a mature mathematician” with “immense potential.” She is expected to become an outstanding research mathematician. Charmaine graciously accepted to be interviewed by the Institution and the following is a transcript of her response. I am very honoured to have been chosen as a co-winner of the Schafer Prize. To be honest, I am not sure that I deserve it — there are many other extremely talented female undergraduate mathematics majors in the USA. I am happy that there is a society like the AWM that supports, encourages and recognises women in mathematics. There is a long list of people who have guided, supported and encouraged me throughout the years and to whom I owe a deep debt of gratitude: my family, school teachers, instructors at the Singapore IMO training programme, professors at MIT, advisors at my summer research programmes, friends, and numerous other people who generously shared their wisdom and knowledge with me, even if it was not mathematics-related; I would certainly not be where I am now without them. 2. What are some of your current projects at MIT? I do most of my research in mathematics at summer research programmes. During the semester I am reading some more advanced material in topology. 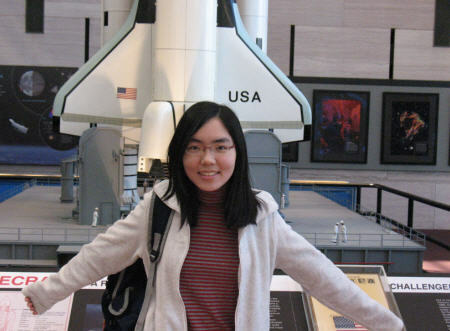 I am a mentor at Girls´ Angle, a mathematics club for middle- and high-school girls in the Cambridge, Massachusetts area, and I also help out at the Harvard-MIT Mathematics Tournament, an annual mathematics competition for high school students in the USA. 3. What are your plans for the future (in two to three years time)? To be a poor but happy graduate student in mathematics, possibly doing topology J (the adjective “poor” is traditional for graduate students J ). I also hope to be involved in helping to organise more programmes for students who are interested in mathematics. 4. What are some of your fond memories of your time at Raffles? One of my mathematics teachers, Mdm Teng, would sometimes ask one of her students to help her order a bowl of vermicelli soup from the canteen. She always wanted it done a special way: 米粉汤，少点米粉，少点汤，多点蔬菜，不要味精 (vermicelli soup with less vermicelli, less soup, more vegetables, and no flavour enhancers). I always entertained the thought of ordering a bowl myself to see what the difference was, but never got around to doing so. Above all I remember the wonderful cohesion and class spirit. This is something that one does not find at university (at least at places where you are free to choose your own courses and not everybody has to take the same courses at the same time). I would not say that having a class grouping is necessarily for the better or for the worse, but it’s something that you most probably will not have after graduating from Raffles. 5. Any parting thoughts to share with our students? To students who are wondering how they will fare in university, I would say that Raffles prepares its students very well to meet any challenges. I am certain that many Raffles students will do extremely well in future, and I hope that when you achieve success, you too will think of and be grateful to the people here who made everything possible.